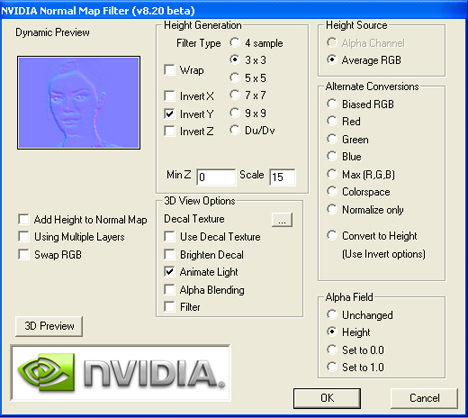 The NVIDIA Normal Map filter creates normal maps from grayscale height maps. The filter UI provides a powerful 3D preview and a variety of filtering options. For MIP-mapped normal maps, the NormalMap Filter should be used for preview only, and then the grayscale map exported via the DDS plugin with “Normal Map Settings…” enabled. This will create a normal map with maximal detail and fidelity for all texture levels, without undesirable filter aliasing.